When I went away last year, I shared with you my travel toiletries as well as the make up I will be taking which was a cut down of my usual make up routine. This year, I'm only taking hand luggage and so the make up I'm taking is even less than last year so this is the cut down of a cut down if you will with some different products as well. Every day I'll be applying moisturiser and sun cream to my face before anything else and apply two products that haven't changed; The Body Shop BB Cream(00 Fair) and Collection Lasting Perfection Concealer(1 Fair). The BB Cream is as light as they come in application with offering hardly any coverage but a little colour to even the skin tone. 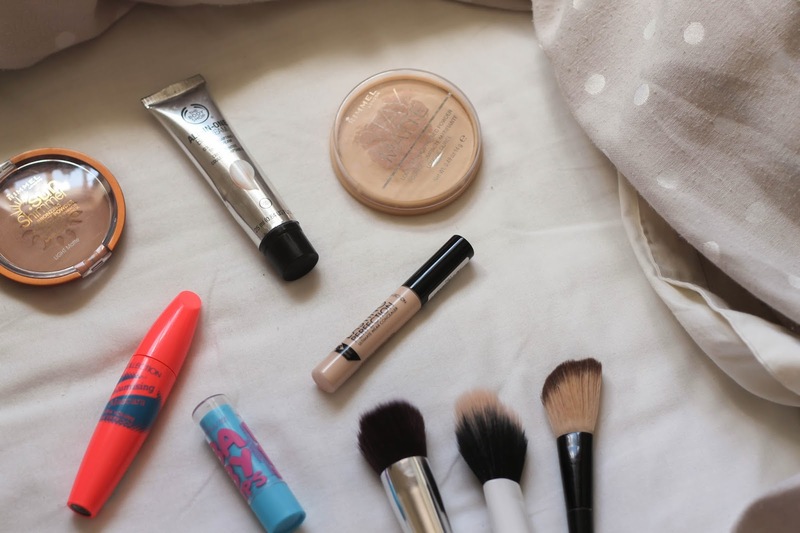 I don't want anything heavy when travelling and would rather leave the hard work of covering up any blemishes and dark circles to the concealer so I'm not overloading with make up. This also means that if I become oily during the day, it's less likely to crease and cake and it's only thin layer. For eyebrows, I'm taking my Maybelline Eyebrow Satin (Light Blonde) as this is all I'll need for my eyebrows as, unlike other brow pencils I've used, I don't need to add a powder or gel over the top and, if I do need to, it has a eye shadow on the other end. There is no eye shadow to be taken but I am going to take a mascara in case we go out somewhere or I'm looking ridiculously tired. I didn't want want to splash out so I picked up the Collection Volumising Mascara(Ultra Black) that is also waterproof as I'm someone who always rubs there eyes and so is why I'd rather not where mascara all together but I think I'd like to have the option as I'm not taking eye shadow and waterproof is probably better for me. Up until last week I was going to take my trusty L'Oreal Glam Bronze because I love that bronzer and use it daily however the packaging has fallen apart and I don't want it's last moments to be crushed in pieces at the bottom of my make up bag and so I picked up the Rimmel Sun Shimmer Bronzer (Light Matte). From swatching it isn't really that pigmented which actually may be good for me seeing as I'm pale and I don't want anything obvious. The BB Cream isn't very dewy and can last quite a long tie so I don't need a super mattifying powder and so I'm taking my Rimmel Stay Matte Powder which, for me, doesn't last as long a other powders I use and so I think it'll be perfect. I'm also going to be taking my Maybelline Baby Lips as, while it isn't the most long lasting hydration, it's enough to get me through the day. As for make up brushes, I'm taking just 3; My Avon Contour Brush which can contour as well as give a subtle all over bronze with my bronzer, My Ebay Buffing Brush for my BB Cream and concealer and my Real Techniques Duo Fibre Face Brush that, even though not as good as the powder brush, is a lot lighter and does the job of just applying a bit of powder. So that's all the Make up I'm taking with me. I set off and Saturday and have post queued to keep you entertained while I'm away. If I miss one day please don't hate me but I'm trying my best to write posts for my usual schedule while I don't have my laptop. I will hopefully have wifi and be updating my twitter and probably my more personal instagram account while I'm in China so I'd suggest at least following me for those 10 days I'm away. How do you cut down your make up? Are you going away anywhere this summer?